It turns out that ‘rain shower’ faucet head you’ve been enjoying every morning is a damn lie. 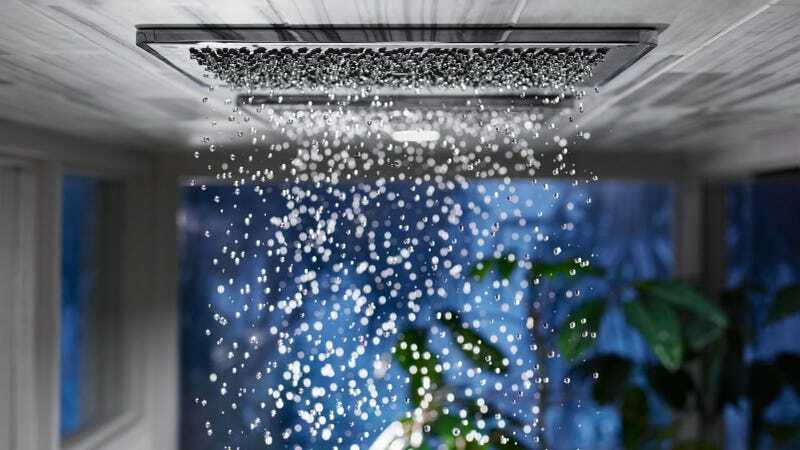 Well, at least according to Kohler, which has gone so far as to name its new showering experience ‘Real Rain’ to convince consumers that it comes as close to cleaning them under a summer rainstorm as humanly possible. The fancy-schmancy showerhead comes with a whopping 775 nozzles, which are apparently able to adjust and vary the size of the water drops and the rate at which they fall. Kohler also claims the shower head can simulate the experience of a growing storm using some kind of “reservoir,” which frankly sounds like a terrifying early morning experience. Availability and pricing aren’t known yet, but judging by other Kohler rain experience shower heads—which apparently aren’t even real rain experiences—you can probably expect to drop well north of $1,000 on this baby. The company, of course, is making some bold claims about its Real Rain Showering Experience™. Kohler’s newest creation certainly looks refreshing, but where’s that weird ozone smell you get with actual rain? Or the sting of pollution as the drops run down your face? We suggest they also add ankle-high jets to blast your legs with dirty water, as if a car just drove by and splashed you, and a hook to hang your perpetually broken umbrella. Now that’s a real rainstorm experience.